How I gained it: Even in grade school, I was one of the bigger girls in my class. I wasn’t really into candy, but I loved bread and pasta, and sports weren’t really part of our lives. My siblings didn’t play sports and my parents didn’t push it. I don’t know that I’d say I didn’t like sports or exercise, it just wasn’t anything I ever thought about doing. When I hit high school, my mom and I went on a diet together. She cooked healthy meals, and I ate what she made. It worked! 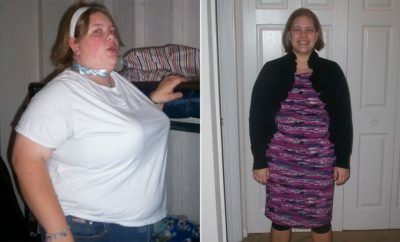 I lost weight and by the time I started college, I was down to a size eight. But that didn’t last. People always say they gain the “freshman 15,” but I multiplied that exponentially. I didn’t know anything about what went into a proper diet, and I had a boyfriend that took me out all the time. My weight just snowballed up from there. Breaking point: There wasn’t one defining moment for me or a doctor yelling at me. I was just finally ready. I was out of breath after walking up a flight stairs. I dreaded shopping for clothes and getting dressed in the morning because nothing looked good on me. I avoided going anywhere on an airplane because I had to use an expansion belt. 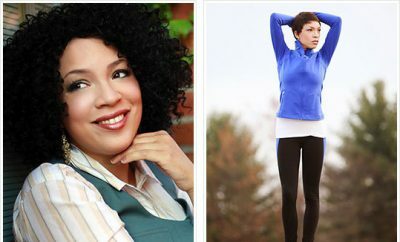 And the worst: I knew I was getting “those looks” when I went out to eat or to buy groceries, the looks that seemed to be saying, “You could afford to miss a meal.” I was up to 336.6 pounds and decided it was time to do something about it. 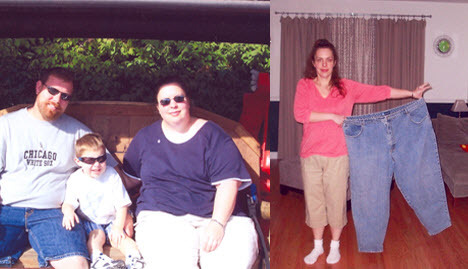 How I lost it: In August 2007, I decided to start Jenny Craig. I was familiar with the program because I’d had friends who were successful with it and my sister worked for the company and followed the plan. The way Jenny Craig is set up was very similar to the way my mom helped me lose weight: Jenny Craig does all the hard thinking, and I just get to follow the plan. There’s no cooking, measuring or counting. Before I joined Jenny, if I cooked at home, I would always be tempted by the leftovers and refilling my plate. But with Jenny Craig, my meals were made for me, in the right portions. In addition to the food, while I was in weight loss mode, I had a weekly meeting with a counselor at the Jenny Craig center close to my work. 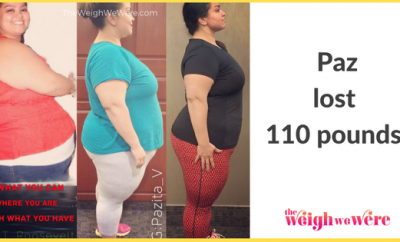 Every week, I had a weigh-in and then we talked about what was working and any challenges I had. We also used a workbook that taught me about new topics related to weight loss and fitness. A lot of my support came from friends at work. There was a group of us that usually went to lunch together, and we ate out a lot! When I started Jenny Craig, I told them, “I’m not going out to lunch anymore. If you need to, go ahead.” They didn’t! Instead, they started bringing their lunches, too. I also have a very supportive husband. He even started adopting some of my healthy eating habits — adding more salads and vegetables — and he’s lost some weight, too! I did have some people in my life that were not so supportive, but I used their negativity as motivation to keep going and to show them that I could do it. Now that I have reached my goal and lost 188 pounds, I am confident that the maintenance program, my friends, and family will get me on my way to the rest of my life. I exercise for about an hour and fifteen minutes everyday, and I love it. I have muscles I didn’t even know existed and now they show. This year, I ran our hometown 5K Turkey Trot without stopping — I didn’t have to walk at all! One of the biggest rewards I’ve received is from my son Joe. He and I can play a lot longer and harder than we used to, and when he sees old pictures of me, he doesn’t recognize the person in the photos. He always asks, “Is this so-and-so?” I think I might just start saying yes! I’m so happy that he won’t remember the “old” me and hopefully, I’ll be able to prevent him from going down that same road. He watches me exercise every morning and sometimes I see him mimicking the moves behind me, so I think he is off to a good start. I know it’s a cliché, but it’s also true: I’m a normal person — I don’t have a trainer, and I don’t even go to a gym — and I did this. If I can do it, anyone can do it. You just need to get in the right mindset and formulate a plan that will work for you. It can be done! 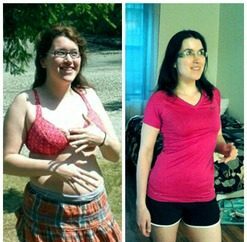 Elizabethhas maintained her 189-pound weight loss since April 2009.
awesome! me too. Im getting it together in 2014. So happy for her journey!! !